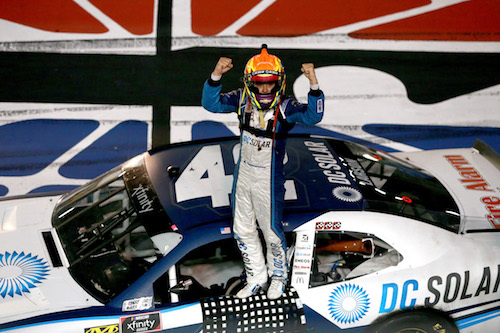 Kyle Larson claimed his fourth NASCAR Xfinity Series win in six starts this season but the first of his career at Bristol (Tenn.) Motor Speedway on Friday night when he took the checkered flag in the Food City 300. He dominated the race leading 202 laps of the 310-lap race. The race was scheduled for 300 laps but extended to 310 by an overtime restart following an eighth caution. Christopher Bell finished second, Justin Allgaier was third, Cole Custer fourth, and Joey Logano rounded out the top-five. Custer challenged Larson for the lead throughout the final third of the race, but he was back to fourth for the overtime restart. Passes on Logano and Allgaier in the final two-lap sprint to the final got the series regular back up to second for runner-up honors, though. Kyle Busch started on the pole and led the first 69 laps of the race before hitting the wall and bringing out the first caution on lap 70 and retiring from the race with a broken A-arm. Custer inherited the lead after Busch’s exit, but on a lap 80 restart, Larson took his first lead. He went on to win both 85-lap stages in the first 170 laps of the race. Pit strategy got Elliott Sadler the lead in the opening laps of the third stage that accounted for the final 140 (scheduled 130) laps of the race, and Bell led 18 laps before Larson was back in the top spot just past lap 200. Finishing sixth through 10th were Sadler, Michael Annett, Chase Elliott, Tyler Reddick and Matt Tifft.